In the early part of 2015, the Highland Park Apartments were purchased by Missouri Valley Operating Partnership LP, the operating partnership for Missouri Valley REIT. Prior to the completion of this transaction and in order for the purchaser to obtain title insurance, an ALTA/ACSM Land Title Survey was required in order to delete the standard survey exceptions from the title policy. TOTH was selected to prepare the highly detailed survey of the land, to include a boundary survey, topographic contours, location of all existing improvements, utilities, easements and any encroachments affecting the property. 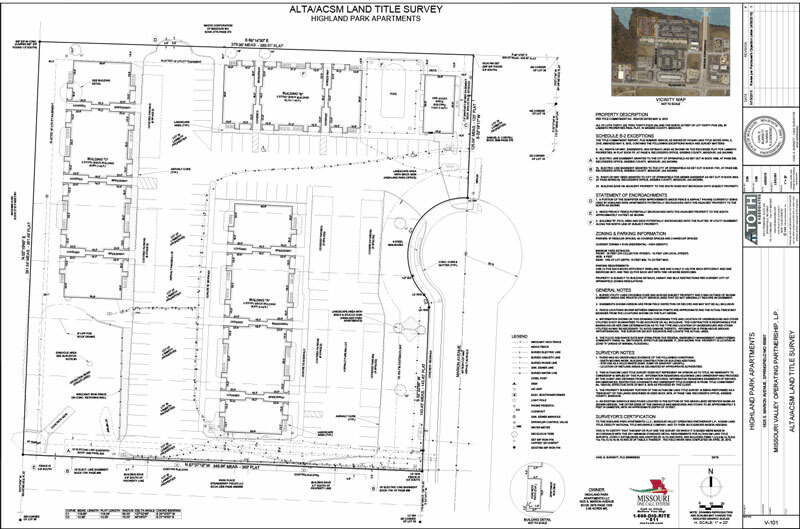 In addition, the ALTA Survey made note of all easements and exceptions cited within the title commitment. Missouri Valley REIT is a Real Estate Investment Trust that seeks to invest in multifamily property in the Midwest Region. Looking forward, TOTH welcomes the opportunity to work with them again on future projects.